Elisabeth Söderström, New Philharmonia Orchestra of London. DECCA 028945257624. Mari-Ann Häggander, Gothenburg Symphony Orchestra. BIS 7318590002704. 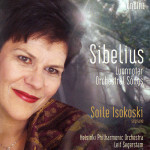 Soile Isokoski, Helsinki Philharmonic Orchestra. Ondine. Karita Mattila, Birmingham Symphony Orchestra. WARNER CLASSICS 685738024322. Phyllis Bryn-Julson, Royal Scottish National Orchestra. Chandos Collect. Brennan, Gerald; Schrott, Allen; Woodstra, Chris. All Music Guide to Classical Music: the definitive guide to classical music. San Fransisco: Backbeat Books, 2005: 1275. Ozorio, Anne. Appreciating Sibelius’s Luonnotar. MusicWeb International. There is a very serious deficiency in Literature discussing this work. Outside of the scholarly sources listed above, little to no formal analysis of this work is published. Most authors that reference it mention it in passing, usually saying that the work is a neglected masterpiece. They then proceed without taking the time to address the work. There are no articles from any well known journals, nor excerpts from any books, nor accessible and substantial program notes available to a person who speaks only English outside of the three published sources listed above (two of which are negligible). While the Goss source is quite exhaustive, it is the only major source available. More perspectives need to be produced if the average listener is to thoroughly understand this distinctive and imaginative work. This work is extremely significant with regard to Sibelius’s personal history. Written between his Fourth and Fifth Symphonies, this work is primarily where he transitioned into the innovator of tradition that we know today. It can be concluded that this work in particular is what helped mature the composer’s compositional style (Goss 1996, 122). Originally performed by piano and soprano, this work was premiered on September 10, 1913 at the Gloucester Music Festival in England. The vocalist who premiered the work, Aino Ackté, was also noted for performing Richard Strauss’ Salomé (Hurwitz 2007, 146). Soon after, in 1914, it was performed in its beautiful orchestral form by conductor Georg Schnéevoigt and sung once again by Aino Ackté. Positive reviews and World War I soon followed (Sirén). Having been written only four years before Finland’s independence from Russia, the work had significance in the political world (Goss 1996, 123). It is clearly in line with Sibelius’ nationalist sympathies, and would not have been well received by the Russians. a. Texture/timbre. This work oscillates back and fourth between light and dark colors while maintaining an atmospheric and ethereal texture throughout the duration of the work. It has an unstable transparency that could be shattered at any moment, and yet a confidence that one cannot help but accept. These depict the text and its story effectively, bringing the listener into an eternity that is only perceptible by the deepest similes and metaphors. Light and dark colors oscillate within this seemingly supernatural texture. The lighter colors are found most clearly in measures 89-119 while the most characteristic dark textures are heard in measures 168-202. In the opening phrase (mm. 1-8) these colors are heard in succession and continue to develop throughout the work. The contrasting colors are brought to a point of perfect balance as the work draws to its climax (mm.149-159) resulting in a tense sort of ambiguity. b. Orchestration/instrumentation. Luonnotar can be performed either as a chamber work with soprano and piano, or as an orchestral tone poem for soprano and orchestra. Sibelius uses the orchestra idiomatically, yet with a masterful level of innovation and creativity. The colors he uses in the strings create an foreign and divine atmosphere from the outset (mm. 1-8, 22-31), and when this is combined with the soprano part the listener is given the sensation of being in the presence of something completely supernatural. The most notable instance of this is in the measure leading up to the climactic moment (mm. 144-149) in which the soloist soars above this texture that is now supplemented by the winds. Every part of the sound rises with the soloist and then descends back down into apparent misery throughout the remainder of the work. The mixture of the of timbres within the orchestra both at this moment and the section into which it leads summarize the distinctive orchestration of this work. A blending of supernatural immortality with anthropomorphic suffering is created so perfectly that the soloist can sound like the goddess being portrayed in the text with a perceived effortlessness despite the actual difficulty of the solo part. c. Meter/rhythm. In conjunction with the contrasting timbres and ethereal texture, the meter intensifies the aura of the composition by oscillating from a driving 2/2 (mm. 1), to a flowing and swaying 3/2 (mm. 54), to having almost no meter at all (mm. 9), though it remains strictly metered in the score. This compliments the melody and primeval textures to convey a clear pulse that can be easily missed if not paid attention. Despite the subliminal meter (particularly in the B sections) the pulse remains so prominent that the listener cannot help but sway with its fluid subtlety. The most prominent example of this subliminal meter is throughout the final section (mm. 160-208). d. Harmonic language. This work rides on the edge of tonality, the most distinctive and important harmonic element being in the B sections where a pitch set very similar to the octatonic scale is used. A minor third is included in the scale to form what could be described as a “harmonic octatonic” scale. Sibelius seems to begin with this pitch set and then freely alter it without losing the essence of this synthetic scale’s sound. This distinctive element is what gives the solo line the etherial beauty required to evoke the emotion needed to portray the goddess in her distress. This is then coupled with tonal ambiguity and a few moments of clear tonicization. Summarized as A-B-A’-C-B, some say that this can be considered to be similar to sonata form due to the way these sections are presented (Hurwitz 2007, 147). However, this is a stretch and the possibility of the rotational form that is typical to Sibelius must be addressed. While this work can be analyzed in sonata form, it can also be approached as having two rotations. The first A through B would be considered the first rotation, and then the second would be the rest of the work (Goss 1996, 130). However it is addressed, this is certainly something that is unique when compared to the majority of the formal structures that Sibelius uses in most of his work. After a brief introduction of a driving 2/2 pulse, the first A2 section (mm. 9-21) introduces the primary melodies. Using a seemingly meterless flow, Sibelius crafts the melody with such fluidity that it contrasts sharply with the driving 2/2 in the introduction. The A’ (mm. 77-119) merges these two contrasting ideas to create a seemingly unmetered pulse. The B section between these two A sections (mm. 54-76) is clearly metered in 3/2, but it still maintains the freedom of the meterless part of the A. This provides very clear continuity within the drastically different feels and tempi; so much continuity that the listener often does not even notice that the feel of the work has changed. The C section (mm. 120-159) begins with using the pulse from the B section and the melodic/harmonic elements from the free part of the first A section. In mm. 136 the 2/2 pulse is reestablished, and a melody that corresponds metrically is join with this pulse. This builds into a climax only two thirds of the way through the work, and then quickly fades into the distinctive B section (mm. 149-160). This B section (mm. 160-208) is arguably the entire point behind the piece, and this is expressed clearly by its length. f. Melodic contour. Every melody flows in time and envelops the listener just as the sea does to the goddess wandering in it. There are no abrupt shifts; everything is smooth and most of the melodies follow accepted contrapuntal guidelines. The shape of the lines seem to be idiomatic to the human voice despite its difficulty. These concepts are carried on into the orchestra as well. g. Phrase structure. Phrases in this work are largely symmetrical. The first 8 measures of each A section is a single period structure while the second part of each A section is completely asymmetrical and difficult to analyze. The B sections are surprisingly ordinary considering the inherent freedom of the melodic contour. The sections that seem to soar with the most liberty and that resemble etherial formlessness have a double period structure. Generally the phrases contrast with each other, switching back and fourth between symmetry and asymmetry. h. Thematic treatment. Although there are clear motivic elements, they could be easily mistaken as improvisatory if not paid attention. While the themes are clearly there, they are treated very loosely and could become anything at any time. At times they do become something else by branching off into various improvisatory possibilities without becoming unrelated. i. Tempo/tempo changes. The tempi seem to change drastically at the start of each section because of the rhythms that are used. These significant changes occur behind the anxiety portrayed by the soloist. Every change in the rhythmic texture can be perceived as a different section of the same sea since the pulse arguably remains the same throughout the work. j. Treatment of dissonance. The dissonances seem to grow upon each other. Nothing resolves, but it seems as if nothing ever needs to because of the nature of the work. If any dissonance did resolve, it would be taken as a weakness in the composition since it so effectively brings the listener into the anxiety felt by the goddess. This is nothing like the way many composers of this time treated dissonance. Here it is treated as though melodies are attempting to find resolution while the harmonies result from the sorrowful wandering of the lines. Contrary to the attempt to cause dissonance to become a default state, here dissonance is created only to more accurately portray the text. Creating atmosphere takes priority over creating dissonance. This work’s inaccessibility is primarily due to the delicate Finnish text. The Finnish poetry in the Kalevala cannot be translated into any other language in such a way as to capture the original beauty, archaic qualities, and meter of the text (Goss 1996, 122). It requires a fine soprano with a fluent Finnish tongue to present the primeval sounds that must be kept in mind when depicting the creation of the world. etelät uipi kaikki ilman rannat. Swam around in all directions. Drove the billows of the waters. Hasten here for thou art needed. Searching for a spot to rest in. Or the waves will sweep it from me. Luonnotar is a beautiful setting of a Finnish mythological story. While being almost universally appreciated by those exposed to it, far too few have become acquainted with the knowledge that the work exists. Due to the difficulty of the solo part and the delicate Finnish text, few vocalists have been willing to attempt it. This unfortunate reality has made the work obscure and known only to the people who are deeply interested in Sibelius’s tone poems. This work is not only given less attention than it deserves, but it can be argued that it is a crucial pivotal moment in Sibelius’ compositional development. (Goss 1996, 122) This work must be analyzed further by credible musicologists if we are to understand Sibelius well enough to fully appreciate the nuances of his work after 1914. This, however, may never occur since the Finnish language will probably never become widely spoken.